The route to improving an organisation’s leadership has long been assumed to be via the development of individuals. These are usually managers who are assumed (by themselves or by their employer) to want to or need to become better at being leaders. The process is called leadership development, though would be better called leader development. This practice is part of the traditional organisational paradigm. But the advent of systems thinking fundamentally challenges this convention. More than the familiar form of leader development, what the organisations really needs is leadership improvement. 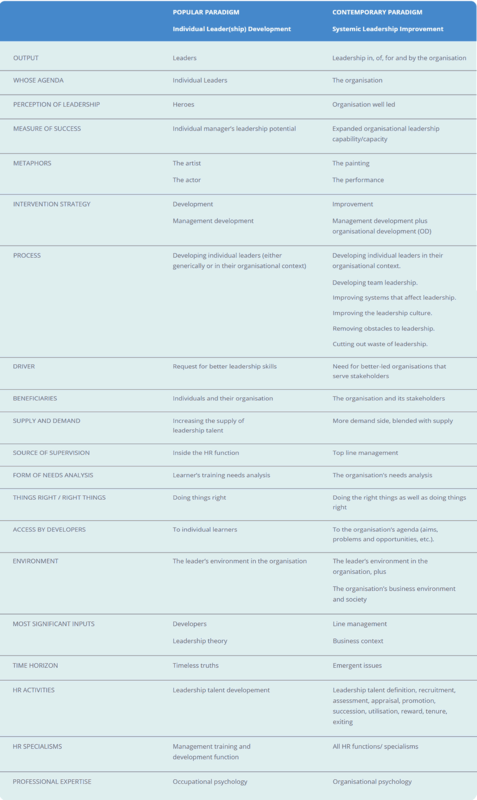 Developing individual leaders in their organisational context. Improving systems that affect leadership. Cutting out waste of leadership. To the organisation’s agenda (aims, problems and opportunities, etc. ).